All reputable jewellers diamond jewellery and solitaire diamonds products are accompanied by genuine and valid certificate from an Independent international labs attesting to the quality of the stone used. The certification is an assurance of the quality of the diamond. The most famous are certifications from GIA (Gemological Institute of America) and AGS (American Gem Society Laboratories). An authentic report from the best and reputable labs is the best assurance anyone can give you with regard to the quality and purity of the jewellery and stones used. It is recommended that you understand various certification grades as they define the stone you are planning to buy. GIA Known to be one of the best certifications, GIA's (Gemological Institute of America) grading reports contain every single detail about the diamond you purchase. It grades every single detail of the anatomy of the diamond therefore making it easy to buy the stone. A not for profit organisation, GIA was established in 1931. AGS yet another standard, American Gem Society Laboratories certifies diamonds based of the characters of the diamond. Grading the 4Cs of the diamond, grading them, also makes this certificate a highly acknowledged one. Date: While reading a certificate, it is always good to check the date of certification first. If the certificate is old, the diamond would have gone through many changes and therefore would require to be certified again. Certification number: This is also an important factor. This is a unique number given to the diamond. In most cases, this number is engraved in the diamond's girdle. The number of the certificate must match the number on the girdle. Usually, the certificate will provide an ideal measurement for reference and the actual measurements of the diamond. It is always good to pick diamonds which are in closer range to the ideal measurements given in the certification. The certificates also contain details about the diamond such as, inclusions, symmetry and polish. If there are inclusions, the certificate will provide details of the inclusions as well. It also provides details on flourescence. Some provide the level of flourescence also. We recommend every buyer only purchase a diamond with a GIA or AGS Certificate. The GIA is the most respected and most consistent of all of the grading entities. In addition to a GIA or AGS certificate, be sure to purchase a diamond from a reputable jeweller. Robert M. Shipley, a successful jeweller in the 1920s, noticed a lack of expertise in the jewellery trade. With a desire to bring trust to the industry, he completed the Great Britain National Association of Goldsmiths gemological course. Then, he launched his own gemology course to certify jewellers. He also started a jewellers' guild. In 1931, the first GIA gemological laboratory was established, creating standards for evaluating gemstones. As a nonprofit organization, the GIA offers gemology and jewellery research and education, along with grading gemstones worldwide. The GIA is based out of Carlsbad, California with office locations in 13 countries. The GIA is the respected entity when it comes to diamond and jewellery grading and certificates. They're the most consistent lab in the business. The 4Cs of a diamond (cut, color, clarity and carat) represent the four main components of its beauty and structure. Each C is graded on a scale. The gradings help determine the value of a diamond and indicate its quality. Diamond cut refers to the quality of a diamond's proportions, angles, symmetrical facets, fire, brilliance, scintillation and finishing details. A top grade designation, like Excellent, doesn't necessarily indicate an outstanding diamond cut. Almost 55% of all diamonds sold online are Excellent cuts. Some are mediocre, while others are stunning. Because cut is so important to a diamond's fundamental beauty, it's crucial to review cut carefully and ask for the eye of an expert. In most cases, the naked eye is unable to tell the difference between two adjacent graded diamonds, though the price difference may be significant. While it's important to know the GIA color grade of a diamond, the most important aspect is to determine if the diamond looks colorless to the naked eye in relation to its setting. Note: Diamonds with a distinguished color, like a fancy green or pink diamond, are valued stones. Grades for these diamonds are distinct from those given to traditional "white" diamonds. When it comes to clarity, we recommend finding a diamond that is eye-clean, so inclusions do not interfere with light reflection. Carat doesn't refer to the size of a diamond, but the weight of it. A 1 carat diamond equals 200 milligrams, or 0.2 grams. Depending on diamond shape and how the stone is cut, two 1 carat diamonds can actually be quite different in size. In addition to the 4Cs, a GIA report provides information about the depth, width and table size of a diamond. Diamond table % is calculated by dividing the width of the table (top surface area) by the width (diameter) of the stone. If the table facet is 4mm wide, and the diamond is 5mm wide, the table % is 80%. The ideal table % largely depends on the diamond's shape. A diamond's width is the length from one end of its girdle (the diameter at its widest point) to the other end of the girdle. The width is most important when it comes to determining length to width ratio, which demonstrates how proportionate a diamond is. Even though the GIA is the gold standard in the lab grading world, a diamond with a GIA certificate doesn't necessarily mean it's more expensive. • The most well respected diamond grading entity. • The most consistent grading entity. • Long history in the diamond industry. • Rigorous grading (ensuring the diamond is what the certificate says it is). • Not a flawless lab entity, although it comes the closest. When looking at a GIA graded diamond, what remains most important is how the diamond appears to the naked eye. The AGS has established itself as a top tier diamond grading organization. As one of the most reliable and reputable lab grading entities, we recommend buyers seek an AGS certified diamond (or a GIA certified diamond). When choosing an AGS diamond, be sure to buy from a high quality diamond jeweller. In 1934, a small group of jewellers who wanted to protect buyers from false advertising and fraud in the diamond industry established the American Gem Society (AGS). They were the first organization to release a diamond cut grading system when they did so in 1966. Today, the AGS provides retailers, jewellers and individuals with gemological knowledge, research, consumer protection and standard grading of diamonds. With clear and consistent grading, the AGS is one of the most trusted lab grading entities in the world. A diamond;s 4Cs (cut, color, clarity and carat) represent the four main components of its structure and beauty. AGS grades each C on a scale helping to determine the value of a diamond and its level of quality. Diamond cut grade indicates the quality of a diamond's angles, proportions, symmetrical facets, brilliance, fire, scintillation and finishing details. Cut is graded differently by the AGS than other labs like the GIA. The AGS assigns a number along with a descriptive word grading. It's important to know that a top designation, like Excellent, doesn't always indicate an outstanding diamond. Almost 55% of diamonds sold online are graded as Excellent cuts. Some are mediocre, while others are stunning. Because cut is critical to a diamond's beauty, it's necessary to review cut quality and ask for an expert's opinion. In almost all cases, the naked eye is unable to distinguish two adjacently color graded diamonds, although the price difference may be significant. The color grade given by AGS helps identify the quality of the diamond's color, yet it's still important to determine if the diamond appears colorless to your own eye without magnification. Note: Fancy diamonds, like a purple or blue diamond, are valued gemstones. Their color grades are different than those of traditional "white" diamonds. For clarity, we recommend looking for a diamond that is eye-clean. The weight of a diamond, not its size, is what carat refers to. For perspective, a 1 carat diamond equals 200 milligrams or 0.2 grams. Two 1 carat diamonds can be quite different in size, depending on diamond dhape and how the gemstone is cut. In addition to the 4Cs, an AGS report provides information about the width, depth and table size of a diamond. 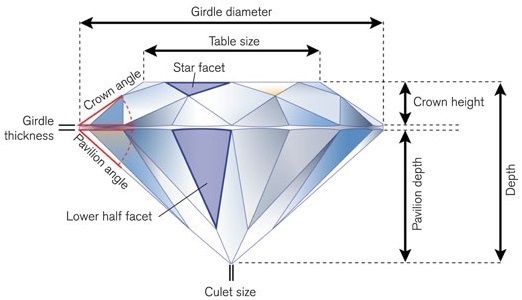 To calculate the diamond table %, the width of the table (top surface area) is divided by its width (diameter). If the table facet is 3.5 mm wide, and the diamond is 5 mm wide, the table % is 70%. An ideal table % depends on the diamond's shape. A diamond's width is measured as the length from one end of its girdle (the diameter at its widest point) to the other end of the girdle. Width is important when it comes to calculating a diamond's length to width ratio, which determines how proportionate the stone is. In addition to the 4Cs and proportions, an AGS report includes further details, like finish, polish, symmetry and fluorescence. These aspects impact a diamond;s beauty, but they are not the most important components to consider when making a decision. The fact that a diamond has or doesn't have an AGS certification does not make the gemstone more expensive. The AGS is an independent grading entity and does not have a stake in the sale of a diamond. Diamonds certified by the AGS sell at similar prices to their GIA equivalents. Generally, the AGS is one half of a Color and Clarity upgrade from the GIA. An AGS certification is one of the best measures to ensure you purchase a diamond that is as it reports. • Offers consistent and reliable grading. • Ensures you;re receiving the diamond quality that the certificate states. • Provides six security measures to help ensure authenticity. • Slightly looser than GIA grading (typically one half a grade in color and clarity). • Education on jewellery and gemstones. • Various diamond report options. We strongly recommend looking for a diamond that is AGS or GIA Certified. We also encourage purchasing a diamond only from a reputable jeweller.